I've seen purple carrots on television but couldn't find it at any fresh food markets until today. I tried yellow carrots not too long ago and it didn't taste like carrot at all. 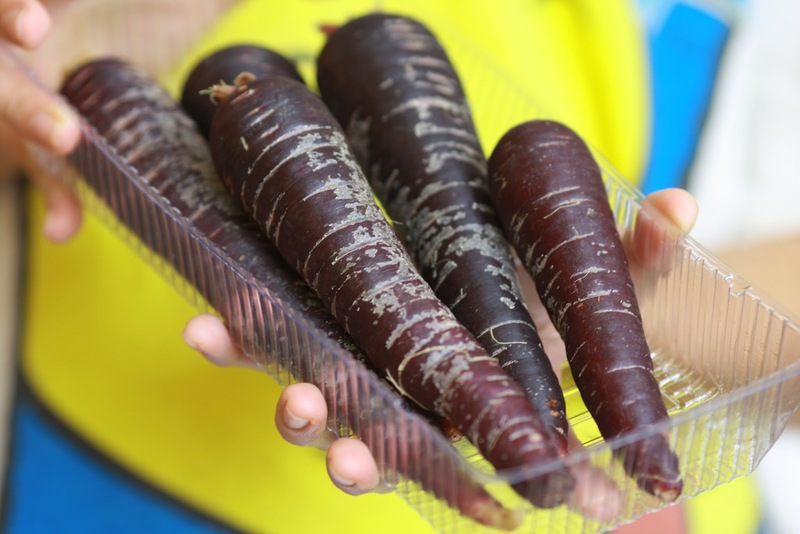 These purple carrots or any food that is purple is packed with powerful antioxidant. Have you tried or seen any purple food anywhere? Cool! I've made purple ondeh-ondeh with purple yam in school once and they looked kinda weird though delicious. So how do these purple carrots taste like? Tried them? I can imagine purplish carrot cakes if you are making them or purplish ABC soup. haha.. These carrots are really in deep purple. The purple carrot tastes sweet when eaten raw. A bit different from the orange one. I found out that purple carrot was the origin of carrot before the orange ones. I'm planning to make purple carrot cake, hope the deep purple will colour the cake nicely. I suppose these purple carrots don't have beta-carotene or vitamin-A. Do you know that too much vitamin-A is poisonous to human? Food in any colours are better than orange. I remembered seeing purple carrots before but definitely have never tasted these before. A thought just came to mind. Would you be using this in your soaps? Or perhaps fresh colors are not recommended? I've used carrots to make soaps before. Squeezed the juice out and up it in, the soaps came out orange. I believe the purple would be fine too. Natural colours normally will turn out great in soaps. Artificial food colourings are not recommended. I think I know about the spinach you mentioned. The purple colour is in the middle of the leaf right? Also with some red? It tastes slightly different than the conventional carrots. a bit sweeter. I love the purple sweet potatoes. They have great texture. Hmm... I didnt even know there are carrots other than in orange color ;) Wonder if these are specific species in certain countries (like Australia)? Coincidentally I recently came across these purple carrots at a morning market in Zurich. I was so thrilled as I've never seen one before. Too bad I couldn't buy any back to Malaysia ... luggage weight exceeded! I'd agree they make a healthier option than the orange ones. No personal or commercial use of images without permission.